, or Longolius, a very elegant scholar, was born in 1490, at Mechlin, although some have called him a Parisian, and Erasmus makes him a native of Schoohhoven in Holland. 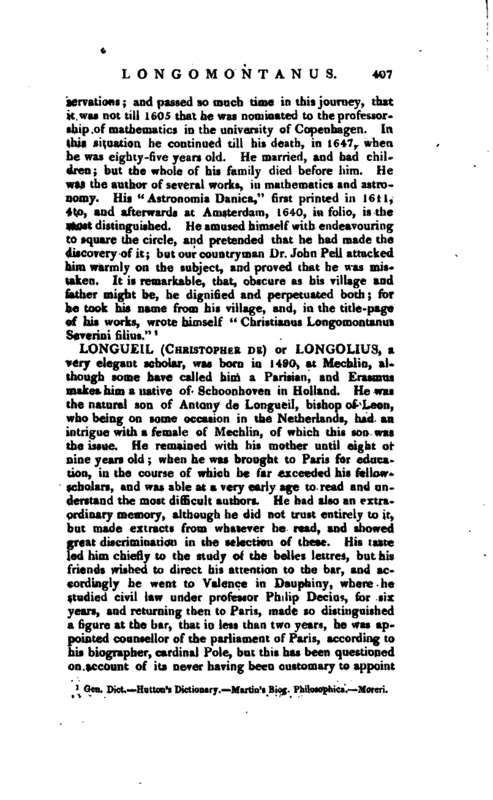 He was the natural son of Antony de Longueil, bishop of Leon, who being on some occasion in the Netherlands, had an intrigue with a female of Mechlin, of which this son was the issue. He remained with his mother until eight or aine years old; when he was brought to Paris for education, in the course of which he fur exceeded his fellowscholars, and was able at a very early age to read and understand the most difficult authors. He had also an extraordinary memory, although he did not trust entirely to it, but made extracts from whatever he read, and showed great discrimination in the selection of these. 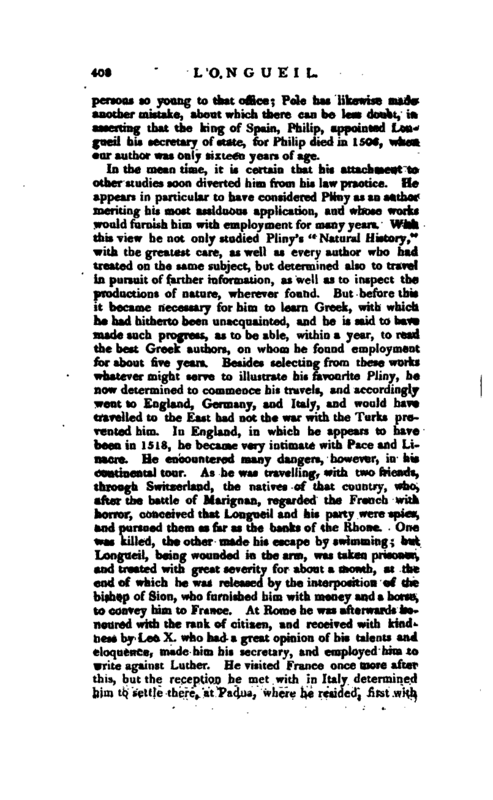 His taste led him chiefly to the study of the belles lettres, but his friends wished to direct his attention to the bar, and accordingly he went to Valence in Dauphiny, where he studied civil law under professor Philip Decius, for six years, and returning then to Paris, made so distinguished a figure at the bar, that in less than two years, he was appointed counsellor of the parliament of Paris, according to his biographer, cardinal Pole, but this has been questioned on account of its never having been customary to appoint | persons so young to that office; Pole has likewise made another mistake, about which there can be less doubt, in asserting that the king of Spain, Philip, appointed Longueil his secretary of state, for Philip died in 1506, when our author was only sixteen years of age. 1 Life prefixed to his works. Nicefon, vol. XVII. Bnllart’s Acad<*mir <1<s S<-ionres, vol II. 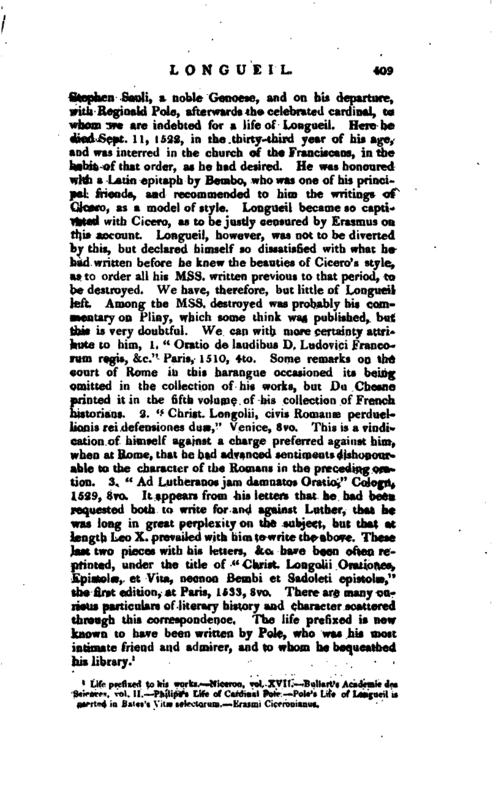 Philips’s Life of Cardinal Pole. 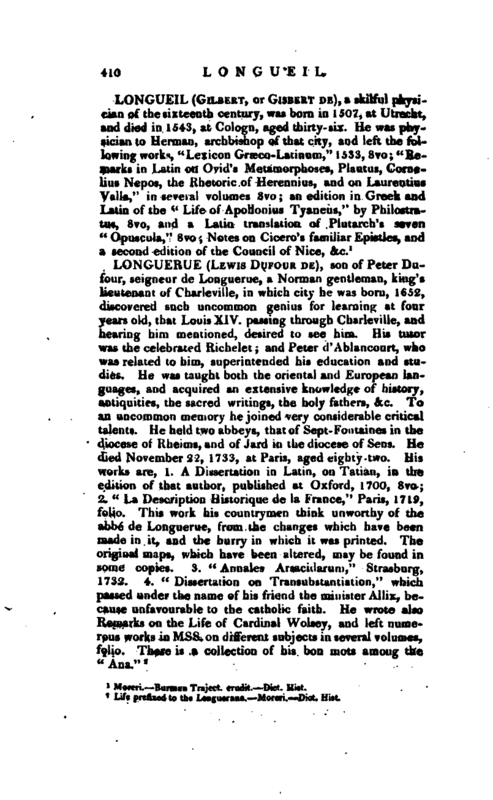 Pole’s Life of Longueil w uvited in Uates’s Vitaj scleclorura. -Eraimi Ciceronianiu.